What Do Int Dev Eng Students Do? Where Do MI Students Go? Jake Carpenter was born in Warner Robins, Georgia where both his mother and father worked as public school educators. Jake attended Northside High School and participated in football, baseball, and swimming before graduating in 2003. He went on to Mercer University in Macon, Georgia with a baseball scholarship but left the team during his sophomore year to focus on his studies in Environmental Engineering. He graduated in 2007 with a B.S.E. and took a position with a Civil/Environmental consulting firm shortly thereafter where he worked on the design of various water, wastewater, storm drainage, road, and streetscape projects for mostly municipal clients. Being inspired by the efforts of a very good friend, Jake began volunteering with homeless service and advocacy organizations in both Macon and Atlanta and quickly found a passion in the service of others. In 2009, while researching the U.S. Peace Corps, Jake discovered the Masters International Program at USF, determined that it was exactly what he wanted to be a part of, and started his applications. 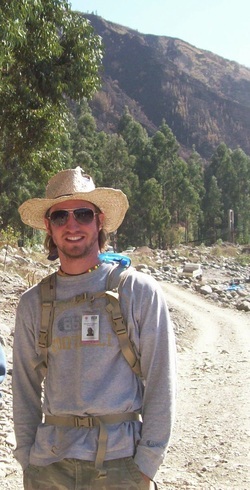 In the summer and fall of 2010, Jake participated in the International Capstone Design program at USF in which he traveled to Bolivia and worked with a team on the design of storm water management improvements to alleviate flooding in a municipality outside of Cochabamba. He is currently in Tampa working toward a M.S.E. in Civil Engineering and assisting a PhD candidate with research in manual well-drilling techniques and low-cost pumping systems. Jake is excited about the cultural exposure and development experience involved with being a Peace Corps Volunteer and hopes that the MIPC program will help him find other ways to contribute to efforts that further health, education, justice, equality, and sustainability. Jake has a brother and a sister: Brian in New York City and Katie in Statesboro Georgia. He enjoys reading, backpacking, paddling, fishing, traveling, riding and working on vintage motorcycles, as well as listening to and occasionally playing music. Above all else, Jake is thankful for a wonderful, inspiring, and supportive group of family, friends, teachers, and mentors that have helped and will continue to help him become the person that he wants to be.